46MS43 was recorded in 1953 and described as a large level field running east/west where pottery, black flint, and shell was found. The site is located in an area between the railroad and the northern bank of the Kanawha River west of the mouth of Threemile Creek. The Fort Ancient component at the site is a small village with burials. The site was excavated by collectors for years. 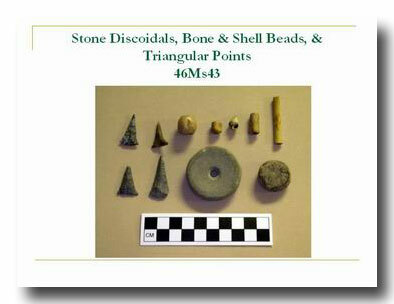 Shell-tempered pottery, triangular points, stone discoidals, bone beads, and shell ornaments were found there. Eight burials were excavated in 1960 by a collector. All but one burial had personal items, mostly marine shell. Hundreds of shell beads were found and a round plain marine shell gorget. No European trade items have been reported from the site, which suggests it was probably last occupied before European contact. A large stone bearing the engraving of what appears to be a panther was recorded in 1963 on the north side of the Kanawha River. At the time, the stone was located on the property of the Burdette family and had been cut from its original location reportedly in a nearby creek bed. The stone was originally used for the owner to mount his horse. 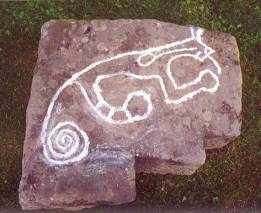 It was reported that before her death, Mrs. Burdette donated the petroglyph to Tu-Endie-Wei State Park in Point Pleasant where it is today. This photograph shows the engravings enhanced with a harmless powder. Photograph courtesy of Steve Shaffer. For many years the Rolf Lee farm was a favorite of local collectors. The site is located on the Ohio River below the mouth of the Kanawha near Gallipolis Ferry on gently rolling floodplain bisected by WV Route 2. The site contains a late Fort Ancient village with a radiocarbon date of A.D. 1666. In 1964, members of the West Virginia Archeological Society excavated the site. The excavations revealed a thick layer of midden (village refuse that is usually full of artifacts), nineteen burials, as well as random postmolds. Postmolds are dark stains in the ground where posts of houses or palisades once stood. Artifacts found include shell-tempered pottery, bone tools, stone implements and gaming pieces, and projectile points. Shell ornaments and European trade goods, including glass beads, copper and brass tubular beads, and flat pieces of copper and brass were also found. 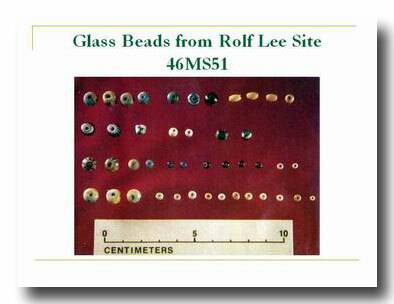 More glass trade beads have been found at Rolf Lee than any other site in West Virginia. European glass trade beads from Rolf Lee. More shell gorgets have been found at Rolf Lee than any other site in West Virginia. 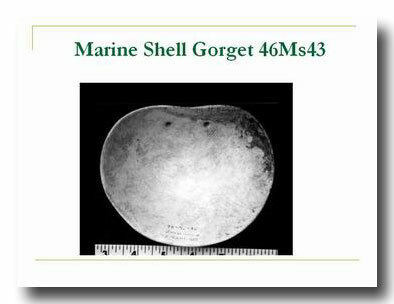 At least 26 marine shell gorgets have been photographed or documented. Marine shell gorgets were manufactured and worn by native people in the Southeast during Late Pre-Contact times. During the same period they began to show up at village sites along the Kanawha River either through trade or with the migration of people into the area. However, they are found disproportionately on certain village sites like Rolf Lee. That could be because of the late time of occupation of the village, or might indicate a close relationship with certain groups in the Southeast. So far, archaeologists have not been able to determine what historically known Indian tribes have ancestral ties to the Kanawha Valley. 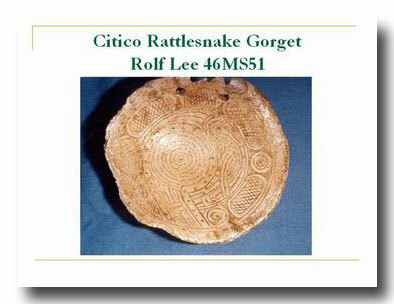 Citico marine shell rattlesnake gorget from Rolf Lee.